UTLA: WHY A TEACHERS' STRIKE AT LAUSD NOW? The Social Studies teacher in me says it would be a big mistake to try and figure out why UTLA President Alex Caputo Pearl and the rest of the reality challenged leadership of UTLA choose now to threaten a strike on behalf of its members and fee payers in the present deadlocked negotiations against Los Angeles Unified School District (LAUSD) without me offering at least a little historical context. Clearly, I don't think it is because UTLA is a good teachers' union looking out for the well being of it members and fee payers, since it has allowed literally thousands of more expensive high seniority teachers to be removed from their teaching careers by LAUSD, based on completely and obviously fabricated charges. 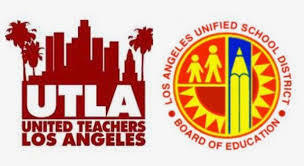 Why hasn't UTLA leadership done anything up until now under Article V of the Grievance procedures in the LAUSD UTLA Collective Bargaining agreement to legally challenge LAUSD"s clearly disingenuous firing of high seniority teachers for the sole motive of saving money? Under this agreement UTLA could have- and still can- bring one unified legal action against LAUSD on behalf of all these teachers...but Caputo-Pearl and his cronies have chosen not to. Why? Because there have been no consequences for doing nothing by a UTLA leadership. Remember that this UTLA "leadership" had originally been put in power by then LAUSD Superintendent John Deasy, who gave Caputo-Pearl and his fellow jokers release time during school hours when they originally ran for UTLA officer positions. Conclusion: These jokers have been in the pocket of LAUSD administration for quite a while now, which is why they have done nothing to vigourously advocate on behalf of its teacher members and rate payers. So what's different now? Simple answer: Janus v. American Federation of State, County, and Municipal Employees, which "hit public-sector unions like a bombshell," because now not only is membership in public sector unions like UTLA not mandatory, but UTLA as exclusive bargaining agent for teachers can no longer charge either members or non-members of UTLA fees for representation as they have done in the past, unless these teacher members voluntarily choose to pay these fees. The conservative Supreme Court in Janus said this would violate a worker's (teacher's) 1st Amendment free speech rights. A bit of a reach, but now the law nonetheless. And things will only get worse with a record number of new conservative appointments to the federal bench at all levels. So one might justifiably say that UTLA threatening a strike is just UTLA's "leaderships" way of saying we are FINALLY doing something quantifiable for you, so that they will not continue to hemorrhage membership, while no longer being able to count on member or fee payer money, because of the Janus Supreme Court ruling. But there is another trumpian possibility, that UTLA leadership might not have thought of: What if the strike doesn't work and LAUSD winds up using it to break the union, so that it can start hiring "teachers" fresh out of college, loaded with debt, and desperate for work at $35,000 a year? They've already been using this gambit in filling the teaching positions of the senior, top of the salary scale teachers they have now been getting rid of for years. There is even one more significantly more paranoid scenario: What if Caputo-Pearl and Company have already been sorted out by LAUSD administration with their own generous silver parachutes that make them immune from UTLA's demise as a union? Naw, that couldn't happen...could it? Maybe we should ask ex-UTLA president and now charter school head A.J. Duffy if this is possible. This reads like a composite of previously asked rhetorical questions. Like all rhetorical questions, the answers are already known or have been told to us by the inquirer. The bottom lines here are the roads to spending as little time as possible in the classroom while still being able to profit of it for those who are repelled by it. There really are only two pathways. The first is most obvious, administration. The future administrator merely puts in the minimum amount of time in the classroom, if any, and then moves into beginning administration from the waiting list. This doesn’t mean that all administrators are opportunistic careerists. Some spend the majority of their careers offering service in the classroom, but most look at that with odium. What they see are the highest paid school administrators in the country at the highest ratio of administrators to enrollment with a 20% increase in administrators during a 25% reduction in teaching staff. The other road less taken out of the classroom is union leadership. One starts by becoming a chapter chair or the like and moves into an elected or appointed union position with a far better salary than any classroom teacher and with an equally superior insurance and retirement package. You may ask yourself, can anyone put an end to this? Why yes they can. The remedy is the teaching profession. However, when less than 30% of teachers vote during city wide union elections, it’s easy for careerist leadership to control the outcomes. And, let’s face it, if the union was a union, it should shut the district down almost at will. There’s really no need to negotiate. If all the administrators failed to show for work, instruction would go on. If even 25% of the teachers failed to show, it would chaos and calamity. So why isn’t such a simple resolution put into action? For two reasons. The first is, again, obvious. Neither district administrators nor union officers want to give up fat salaries with excellent benefits and retirement programs. The other it that it’s these same teachers who validated every weak giveaway contract the union presented to them. It’s these same teachers who stood by and ignored their senior peers who have continued to be targeted for removal by orchestrated below standards evaluation and false accusations of one impropriety or another. They have been fine with it as long as it wasn’t happening to them. Will any of this change? I doubt it. There aren’t enough spine donors to meet the demand.